From Perfectil, the UK's No.1 supplement for skin, hair and nails, comes Perfectil Plus Protan™. 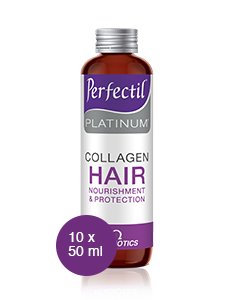 Perfectil Plus Protan™ provides all of the benefits of the original Perfectil formula, plus specially selected micronutrients to nourish from the inside, including L-Tyrosine, Lycopene, Grape Seed extract and Carrot extract. Perfectil Plus Protan™ does not provide a UV protection factor. Our skin, hair and nail health is important to maintain throughout the year. 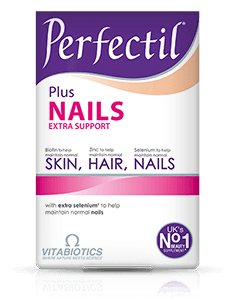 The specific vitamins and minerals within Perfectil Plus Protan™ help support the building blocks of your skin's lower dermal layer, hair follicles and nails, for normal health and appearance. 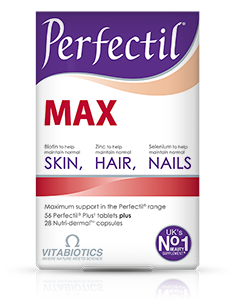 Because Perfectil Plus Protan™ is so comprehensive, there is no need to take an additional multivitamin, or additional Perfectil product. Perfectil Plus Protan™ is recommended at least one month before jetting off to your sunny destination, and continued for as long as required when back home. Perfectil Plus Protan™ is available in the UK from Boots and Holland & Barrett. Alternatively order online here. Bulking Agents: Maltodextrin & Microcrystalline Cellulose, L-Tyrosine, Magnesium Oxide, Vitamin C (Ascorbic Acid [Carriers: Hydroxypropylmethylcellulose & Tartaric Acid]), Lycopene Extract, Tablet Coating (Hydroxypropylcellulose, Hydroxypropylmethylcellulose, Medium Chain Triglycerides, Natural Source Colours [Titanium Dioxide, Riboflavin, Carmine], Anti-Caking Agents: Silicon Dioxide, Stearic Acid & Magnesium Stearate, Pantothenic Acid (as Calcium Salt), Vitamin E (D Alpha Tocopheryl Acid Succinate) (from Soya), Natural Carrot Extract, Zinc Sulphate, Ferrous Fumarate, Natural Mixed Carotenoids (Betacarotene, Starch, Water, Antioxidant: DL-Alpha Tocopherol), Crosslinked Cellulose Gum, Niacin (Nicotinamide), L-Cysteine, Green Tea Extract, Vitamin B6 (Pyridoxine HCl), Thiamin (Vitamin B1 as Mononitrate [Carrier: Hydroxypropylmethylcellulose), Vitamin B12 (Cyanocobalamin [Carriers: Maltodextrin, Trisodium Citrate & Citric Acid]), Vitamin D3 (Cholecalciferol [Carriers: Acacia, Sucrose, Corn Starch, Medium Chain Triglycerides, Anti-Oxidant: DL-Alpha Tocopherol]), Grape Seed Extract, Riboflavin, Co-Enzyme Q10, Copper Sulphate, Manganese Sulphate, Folic Acid (as Pteroylmonoglutamic Acid), Chromium Trichloride, Sodium Selenate, Potassium Iodide, Biotin. Allergy Advice: For allergens, see ingredients in bold. TWO TABLETS PER DAY WITH YOUR MAIN MEAL. Swallow with water or a cold drink. Not to be chewed. Do not exceed the recommended intake. Perfectil Protan tablets should only be taken on a full stomach. Ideally recommended from 1 month before the start of your holiday, to 3 months after your return. This comprehensive formula replaces other Perfectil supplements and multivitamins. There is no need to take an additional multivitamin. As with other food supplements, consult your doctor or pharmacist before using if you are under medical supervision, pregnant, breast-feeding or suffer from food allergies. Allergy Advice: For allergens, see ingredients in bold. This product contains iron, which if taken in excess, may be harmful to very young children. Food supplements must not replace a varied and balanced diet and a healthy lifestyle. Store below 25°C in a dry place, out of sight and reach of children. 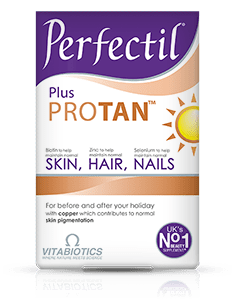 Why has Perfectil Protan been developed? Who should use Perfectil Protan? 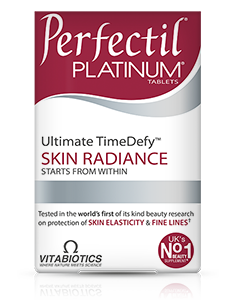 Does Perfectil Protan protect the skin against UV rays? Can Perfectil Protan be used during pregnancy and breast-feeding? Can Perfectil Protan be taken simultaneously with medicines? 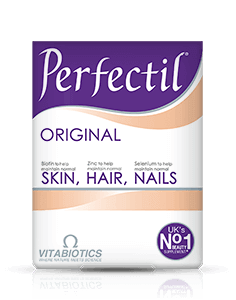 How many tablets does one pack of Perfectil Protan contain? How and when should Perfectil Protan be used?